Students have raised further protests after the University of Bath paid £16,000 for a painting of its former vice-chancellor who was forced to resign over her £470,000 pay package. 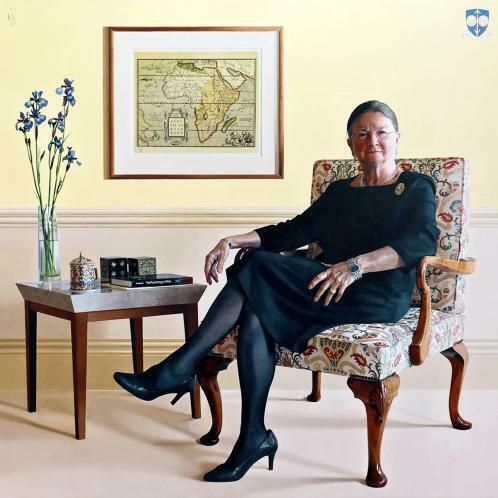 The oil painting of Dame Glynis Breakwell and its accompanying plaque have been mysteriously removed from alongside the paintings of other former vice-chancellors, according to the student magazine Bath Time. Dame Glynis, 66, was the highest paid vice-chancellor in Britain. She resigned last August after a lengthy dispute and accusations of excessive pay from students and staff. The Earl of Wessex unveiled the painting on February 25. A freedom of information request sent to the university by the student magazine disclosed that the work and its frame cost £16,398. The plaque labelling the painting cost the university an extra £462, and the unveiling event cost £750, the same request found. Joshua Waterhouse, who describes himself as a hyperrealist artist, painted the portrait, an oil on wood panel that measures 122cm square. The home occupied by Dame Glynis for more than 15 years has been put up for sale by Bath University for nearly £3 million. Proceeds from the sale of the five-bedroom house will be used to renovate a campus property to provide guest accommodation and host events. Dame Glynis stepped down on August 31, last year. She had been granted a sabbatical on full pay before retiring last month. The university disclosed that it would write off the interest-free loan for her £31,000 car, which she was allowed to keep. The university said: “Portraits have been commissioned for all previous vice-chancellors, including the most recent, to mark their contribution to the university. A procurement process for the painting was conducted and authorised by the university secretary and previous chair of council.” Asked whether the portrait had been removed a spokesman refused to comment. The university has appointed Ian White as the vice-chancellor on a salary of £266,000, more than £200,000 less than his predecessor. Dame Glynis was a member of the remuneration committee that since 2011 had increased her pay by almost £200,000 in five years. The row initially erupted after a freedom of information request by the Bath Chronicle. The decision to raise her pay by £50,000 in 2016 caused dismay among students at Bath. The increase made her the highest paid vice-chancellor in Britain. She sparked further outrage after it was revealed that she claimed expenses for items including biscuits worth £2. Hundreds of students protested against her salary by throwing bourbon cream biscuits, fig rolls and all-butter shortbreads during a campus march in 2017. One of the university’s advisory bodies told it to dismiss Dame Glynis immediately in January last year. The university’s court, a 200-strong body, passed a motion expressing no confidence in Dame Glynis, the chairman of the university’s council and the entire remuneration committee.